After the death of her husband in an horrific plane crash, Gemma Sinclair defies community expectations, and her husband’s dying words, by taking on the daunting task of managing the 100,000 hectare station he has bequeathed to her. As if Gemma’s grief and the job of looking after Billbunya Station aren’t enough, a wave of innuendo sweeps the community that her husband’s death was no accident. Struggling to uncover the truth of these rumours while battling to keep Billbunya afloat, Gemma wonders if she’ll ever find peace or love again. This is the first book from Fleur McDonald and I hope not the last. Some of the advance material put this book in the same category as Rachael Treasure, not having read any of that author’s material I’m not able to make a comparison. 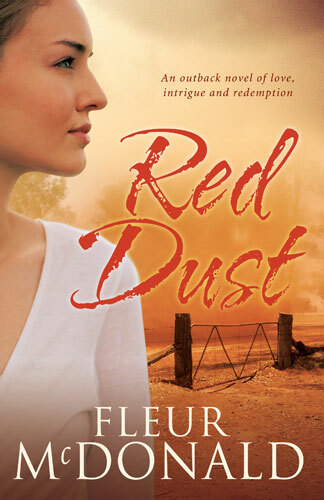 What I do know is the characters and the story in RED DUST are a fine representation of small country town life and very Australian. The story is an old one; because of the death of her husband a woman is left alone to carry on, and yet the author has put a modern slant to the characters and the happenings without losing the flavour of the outback. The main character, Gemma, is a strong woman who knows what she needs to do and brooks no interference from those who think they know better. Gemma is no shrinking violet. There are people in the town who know Gemma and her husband, Adam, and respect them both; there are others who think they know what Adam was up to behind Gemma’s back and are waiting for the ‘other shoe to drop’. Plus there’s a bit of small town sniggering going on in the wings. The author has drawn some very interesting characters, there’s the strong silent man, the friend who is a friend and the friend who isn’t. And while the characters may seem ‘traditional’, the author has given them three dimensional personalities that make them new. And whilst you think you know what is going to happen at the end, the author has given it a nice fresh twist. The aspect of RED DUST that I liked the most was the language……it is straight out of the bush, natural and not over done or cringworthy. It certainly shows that the author has lived on the land and understands the conditions, the people and the traditions. I read this book in a couple of sittings and was pleased to be able to pick it up each time. The story’s main themes are loyalty, friendship, trust and of course, love.